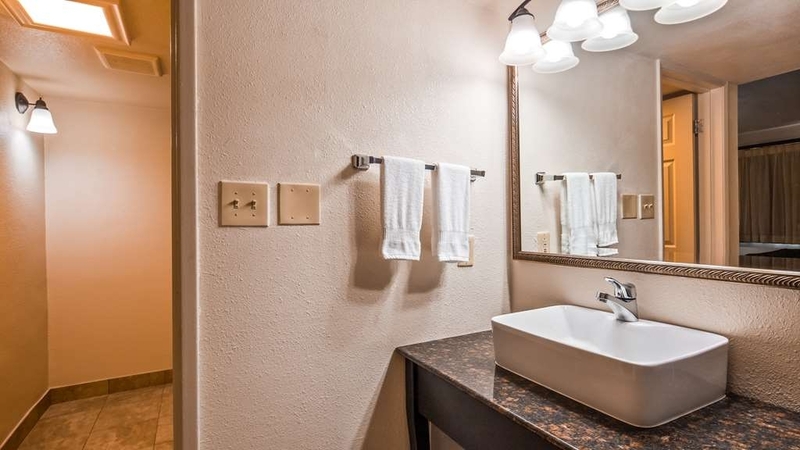 The Best Western Town House Lodge is ideally located in the center of Modesto. Come and experience our hotel near the major tourist attractions. Best price guaranteed and exclusive deals. 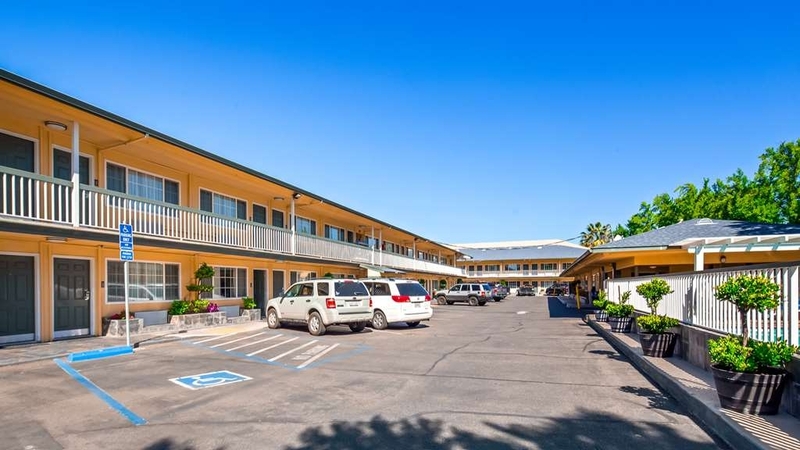 Whether visiting Modesto on business or pleasure, or passing through on your way to San Francisco or Yosemite, Best Western Town House Lodge offers convenience and comfort at an affordable price! This 100 % non-smoking property is located in the heart of Modesto, making it easy to explore the city and surrounding areas. The town's most popular attractions, including the McHenry Mansion and the McHenry Museum, are within walking distance. Downtown Modesto offers an abundance of fine dining, shopping and the arts - the historic State Theater and the modern Gallo Center for the Arts are only a few blocks away. Our convenient location also makes this Modesto hotel a great pick for guests attending local conventions, weddings and other events. 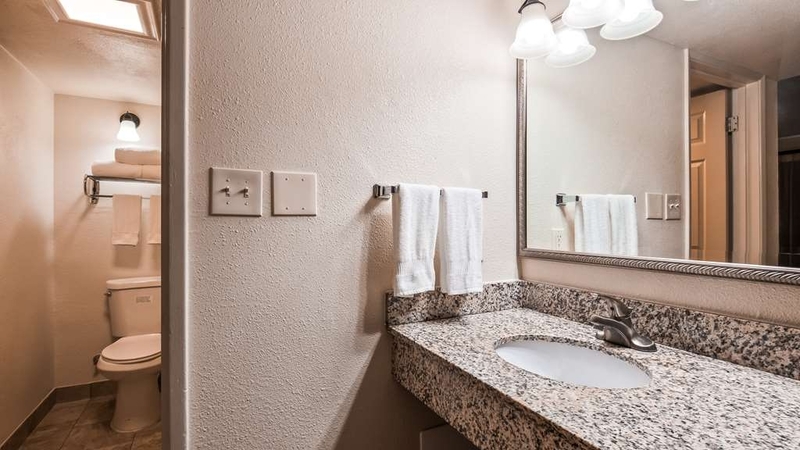 The Best Western Town House Lodge is also the perfect choice for guests en route to central and northern California's most popular destinations. 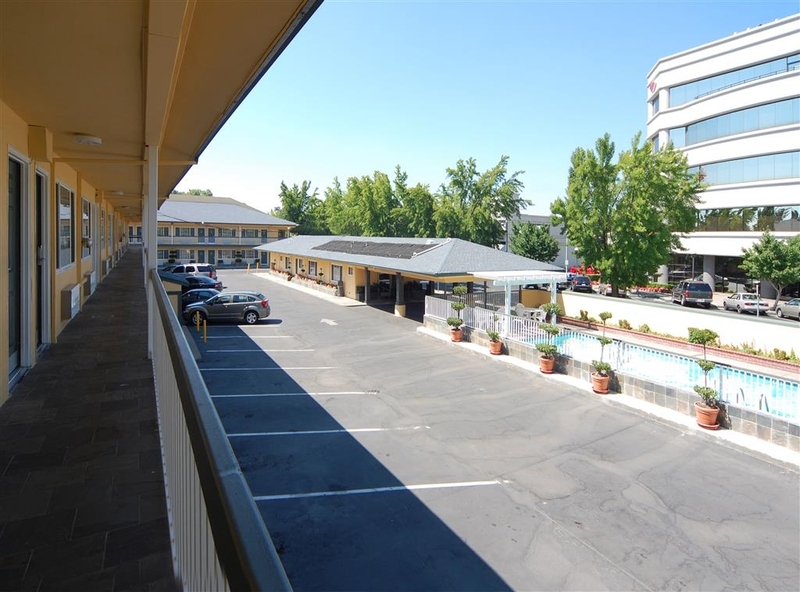 Yosemite National Park, San Francisco and Sacramento are all within 100 scenic miles of this Modesto hotel. This pet-friendly hotel in Modesto offers all the conveniences of home. Our newly renovated, boutique-style rooms feature cable satellite television, free in-room wireless Internet access and a daily newspaper. Guests can start their day off right with a complimentary full breakfast buffet, or they can unwind after a long day with a dip in our sparkling outdoor pool and hot tub. 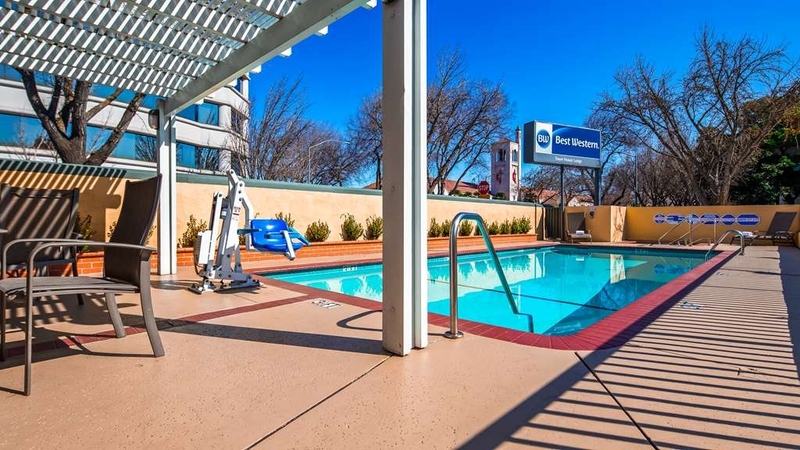 Come experience all that Modesto and the Best Western Town House Lodge have to offer today. Our friendly staff looks forward to making your next visit to the area your best yet! We stayed here last minute - I was exhausted, and defaulted to Best Western since it is usually decent and reasonably priced. But this one reminded me why I usually go for the Best Western PLUS rather than just the regular Best Westerns. This hotel was cute, clean and had a decent free breakfast but I barely slept because of the noise from the street and the parking lot outside, plus the creaking and thumping upstairs (we were on the first floor). I'm not a particularly light sleeper, and I don't think I've ever had this issue at at a Best Western, so I was pretty disappointed. If they had given me earplugs and a better rate I'd definitely recommend it, but as is I would suggest either someplace cheaper or someplace nicer. A comfortable place to stay near the Downtown area. Rooms are clean, well furnished, Wi-Fi is not ever a problem. No fuss, easily accessible, friendly staff.If you appreciate your privacy and anonymity, this place is excellent. "No security rooms are old and faded." Skip this Hotel! Book elsewhere stay off 99 at Pelandale. This property is centrally located around homeless and drud addicts! Homeless liter the surrounding area and you will not sleep! Good luck if you dare! If your on a budget and won't be sleeping then this might be your spot. "Well exceeded expectations especially for a last minute unexpected stay"
Staff was exceptional . The cleanliness of the room was outstanding. Even had a late check out. Only complaint it have to give one is room is a lil on pricey side but you get what you pay for. Definitely not too high to keep me away. Definitely will go again. Location is in the center of Modesto, and thus away from the noise of the highway. There are several food/drink businesses within walking distance. Rooms are pet friendly. The breakfast buffet is nice to have. "If you need to be SUUUPER close to Mchenry"
If you have to be close to venue for no other reason besides not able to walk, then this would be the place. I can only base my review on my room, although others in my group may not have had the same issues. The staff are what make your stay at this Best Western so comfortable. The rooms are clean, comfortable bed, plenty of hot water, wifi, cable television, in room microwave, refrigerator, coffee maker, iron and board, and blow-dryer. The breakfast room is clean and stocked nicely with many choices, fruit, yogurt, cereal, pastries, waffles, scrambled eggs and bacon and sausage, toast, juice, milk, coffee, instant oatmeal, etc. But the courteous staff go that extra mile to accommodate you when possible and that makes you feel more at home. Situated in the town there was too much street noise from cars and motorbikes who appeared to be going around and around the block. On top of that the occupants of the room above did not stop moving until the early hours of the morning back and forth across the floor. Although appears to be the right place as has outside pool and decent rooms the cons far outweigh the pros. Sorry but could not recommend a night here. The room was not very clean. Upon first appearance it seems clean but you are hit by an odor when you walk in the room. There were also sticky counters, dirty bathtub, hair dryer did not work. Thankfully, the sheets looked and seemed clean and the bed was comfortable. But you had to have the air conditioning on full blast to cover up the dirty rug (?) smell. Staff was unfriendly or more accurately, indifferent at the reception desk both upon check in and check out (2 different people). Clean, updated and reasonable rooms. Saturday mornings across the street there's a quaint farmers market in the vicinity. Walking distance to restaurants of different atmospheres to suit anyone's mood. Warm welcome at check in. Clean room and bathroom, with comfy bed and fluffy towels. Located close to McHenry Mansion. Disappointing, basic breakfast. The baked goods were stale. No butter available only dairy free (vegan) vegetable spread. When I requested butter for my toast, the breakfast staff argued that the vegan spread was butter. I later mentioned this to a young lady at check out, stating that this was the first time, in many years of touring the USA, that I'd been unable to get butter. Her response was that they did not supply butter because many guests prefer “gluten free”. I had neither the time nor inclination to educate her on the difference between gluten free and dairy free! Additionally, though this is a non-smoking hotel, people were smoking in the outside space next to their rooms. Unfortunately, the person below us was smoking cigarillos and the stink permeated our room whenever we opened a door or window. My family and I stayed here for one night and enjoyed our stay. The beds and pillows were very comfortable. The rooms were clean and spacious. They also had the necessary toiletries and provided enough towels. Surprisingly the breakfast was very good. I have never been to a hotel that offered so much. They had eggs, bacon, sausage, waffles, yogurt, etc. The only downside about the stay would be that my father's room smelled like cigarette smoke. We called the reception and offered to move to a different room. All the staff we encountered were very friendly and welcoming. I would definitely recommend staying here. "An older but well maintained facility." It was easy to find and convenient to downtown area. Staff were friendly and helpful with directions. For the price, it was very good and the bed was very comfortable. Breakfast was the usual offering and the staff tending the breakfast area was very attentive and helpful. Would definitely recommend as a reasonably priced, clean and well maintained downtown hotel. The hotel is nice inside, the front desk staff is friendly, breakfast is adequate. It's in a busy area, and you can't pick who else stays there, so it was a little noisy at times. Overall it's a good hotel for a few overnights. "Budget lodge but very good." We stayed during our trip for 1 night. Welcoming is polite and helpfull to find directions in the city to restaurants etc. The included breakfast contains fresh made waffles which is nice. Room is clean and spacious and the lodge is a short walking distance from the center. Really value for money. I expected nothing less: the staff was friendly, the room was clean. It was close to where I needed to be the next day (I only stayed one night), so it was conveniently located. The staff was very attentive, making sure I was comfortable as soon as I got into my room. We were displaced from a flood in our home and BW was chosen as a 7 day stay for us during this time. The facility is awesome staff attentive, comfortable beds, clean rooms and great breakfast every morning. So grateful for the help finding us 5 rooms all together..
"I loved being at BW Town House Lodge"
The rooms here are comfortable and it was everything I needed. The staff was amazing. Everyone was friendly and welcoming. They were very receptive and helpful any time of day or night. I did not eat the breakfast because I'm not crazy about hotel breakfast offerings. This appeared pretty typical with the scrambled eggs and meat offering. The room was well maintained and the maids did a great job keeping it clean for me. The beds and pillows were comfortable. I loved the location. It is across the street from the library, and twice a week there is a farmers market next to it. It is a short walk to downtown and some wonderful restaurants, 2 movie theaters, and the Gallo Center for Performing Arts. 2 blocks over is a grocery store, a nice laundromat, and more restaurants. Do not let the fact that there are homeless people wandering the area. This appears to be common in most areas of Modesto. They are just out there trying to survive and get through each day. They mostly mind their own business, and do not bother you. This is a very quiet area, and there was never any noise when trying to sleep, except for an occasional guest who turned their TVs up to loud. This was easily dealt with. I had my dog with me, and he was happy too. I would definitely stay here again if I am back in Modesto. I travel for my work, and stay in a lot of different places. As far as hotels go, this was one of my favorites. "Strange Odor & Large Homeless Population"
No difference between "regular" and "deluxe" rooms but the difference in price. Stale odor upon checking-in, so much so, that we left our window open to air out the room with very cold temps outside. Staff is less than excited to help - not that they are rude, it was just obvious they don't enjoy their jobs. The springs in the beds were horrible. I reserved this room for my parents for a family funeral and my parents were very pleased. My parents were comfortable and happy that breakfast was included. It was very close to the funeral home and family. I was passing through Modesto for work and found this night little hotel in downtown Modesto. The room was clean and in good working order. The king size bed was comfortable. This place was very close to the community days event that was happening in downtown. Nice location in downtown. Run down property with terrible breakfast. I have stayed here several years ago and it needs lots of improvements and updates. Front desk staff very friendly. Pet friendly, dog park close by. "Top Quality Place to Stay"
I can't say enough. This place is great and the staff made me feel at home. Next time I come to Modesto, this is where I am staying. Clean, well managed, great staff and a hot breakfast to get me going in the morning. TEN STARS. "Quaint hotel, Top Noch Employees"
Hotel was nice, not too much flare, but what it doesn't have in flare, it makes up for in the staffing. extremely helpful staff, even late at night. Rooms were comfortable, ac units were not that loud, and on when I got in the room so it wasn't stuffy and hot when I walked in. Internet service was one of the better functioning ones than most hotels. "Good hotel that needs some work"
I stayed her for a couple of nights as a get away weekend. Pros: * Good breakfast with lots of variety ( waffles, eggs, sausage, bacon, and most common cold breakfast items ) * Walking distance to places to eat ( Denny's, Jack in the Box, etc.) * Very friendly and helpful staff at front desk including someone on site 24 hours a day * Plenty of parking on site Cons: * Room was not cleaned during our stay (we only stayed two nights) * Noise from outside could be easily heard * Room had only one electric outlet that was useable. Overall, it was a nice stay, but the rooms need some work. 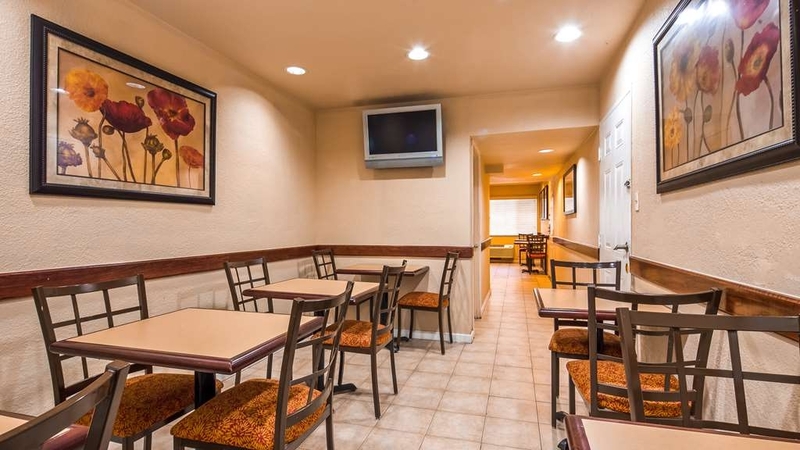 I enjoyed the location of Best Western 10 min drive to my class and walking distance to plenty of restaurants. The only negative was the distance to Walmart. However a Rite Aid is relatively close. I went American Building Company for training and this Hotel is 10 min away while the recommended one is 30 min away. It is also a relatively simple route to the class as well. The staff at this place was super nice. It's nicely situated in the downtown area and made it easy to get around. Other than that, average place, but for the price I wasn't complaining. Floors were a little squeaky and my bathroom was super tiny, but that could've just been my room too, so I can't speak for the rest of them. I really did like the people there though, they were so friendly. This hotel is cute, looks like it has been cleaned up and remodeled recently. The staff is friendly the WiFi signal is excellent. Close to all the downtown things to do and might life. Safe enough for my family to staff and we were able to walk to the Gallo arts theater. We stayed here one night after coming from Yosemite. Our room was a bit worn down. My bed lamp did not work and there was a hole in the headboard of our bed. Many things of the breakfast was missing and we had to wait until it was replenished. "Good location and quality, some unwelcome approaches"
The Lodge is in a central location and within walking distance of most of Modesto's attractions. Rooms are comfortable and well furnished. Staff were helpful. Only down side was the unwanted attention from meth users in the morning when loading up the vehicle. Just be a bit careful as a result. "Best Western Town House Lodge"
I travel California constantly as a traveling service technician. I stay with primarily Best Western hotels because I like the chain, the hotels are clean and nice, rooms clean. I know what to expect when I stay at BW's and The Town House Lodge is no exception. I enjoy staying here, the staff is always friendly and helpful. Rooms recently remodeled. Its always a pleasant stay. Stayed here last month for business. Great location down town near everything. McHenry museum is right next door and all good restaurants are within a few blocks. Can be noisy at times but that's downtown. "Nice surprise stay in Modesto"
We had just stayed at Best Western in Oakhurst the previous 2 days and weren't sure what to expect here. This was not really the best part of town. Quite a number of homeless people in the area. However...we were pleasantly surprised by the internet connection. I was able to upload all my YouTube videos I made of the concert we attended that night (which I could not do at the Oakhurst Best Western). Secondly, it was VERY hot the day we stayed there and I was happy that the air conditioner in the lobby and in our room kept things comfortably cool. The warm breakfast, although in a quite confined space was everything I usually expect from a Best Western (eggs, sausage, bacon, yogurt, oat meal, cold cereal, bananas, apples, etc). The only thing missing I normally enjoy was no English muffins. 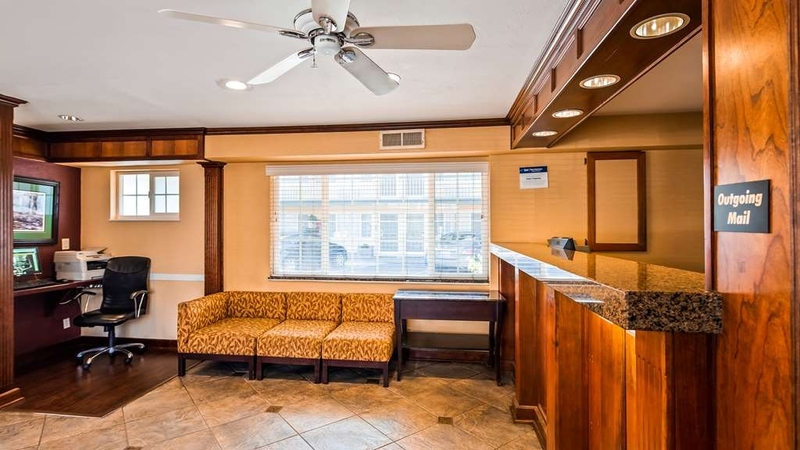 The facility was a somewhat older Best Western but had what we needed and expected. We will stay here again the next time Modesto is on our agenda. We stay here when visiting Modesto as the location is ideal for us. They were remodeling and things were kind of messed up but workable. Friendly staff. A little disappointed with breakfast. They were out of yogurt over two days. The orange juice seemed watery. The tables were not all that clean. I noticed they wiped the top of the table quickly but not around the edges (where it really matters) and they were sticky, dirty feeling. They should pay a little more attention to that. Overall, it has been a good place to stay but I hope they don't go downhill. "Good Service and Location, Old Rooms"
We stayed for 1 night in the Best Western Town Lodge in Modesto in August. Our overall rating is due to a sum of the following voices: Service = 5 stars: the receptionst gave us all the information we needed about the city and places to eat. She was very friendly. 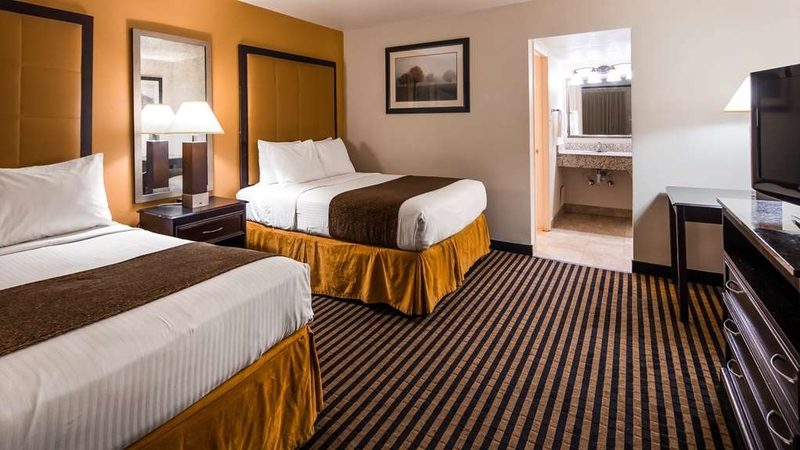 Position = 4 stars: the hotel is placed in downtown Modesto, so you are close to the main attractions of the city and the best restaurants. We have to add that downtown Modesto is not well frequented during the night (many homeless people hanging around), and you don't cross a single person walking in the streets from 7 pm to the morning, so it can be scary. Breakfast = 3 stars: breakfast was ok, nothing special but the average breakfast you can find in American Motels. Room = 2 stars: even though the room assigned was big and with a lot of space for luggages, we found it old and kind of stinky. The bathroom was loosing pieces from everywhere and the general atmosphere was gloomy. Would not recommend. Many homeless loitering around downtown and this area. For a Wednesday night it was very loud. My room smelled and the shower was a tiny corner shower with low water pressure. In the morning there a man passed out on the ground just outside my room who I had to step over to get to the stairs down to my car. "No complimentary newspaper, Misc. Maintenance issues. Excellent location." We stayed here to attend a wedding at the McHenry Mansion. Perfect location. Front desk pleasant and helpful. Directed us to Harvest Moon Restaurant which was a delightful experience. Gave us printed directions to Costco for gas, opened the pool area early so we could enjoy reading the paper there in the cool of the morning. No paper though, had to buy one from the vending machine and no apology. We don't have TV and were looking forward to a movie on HBO and it didn't work the first night we were there and they were unable to fix it. Working next night, but only series we were not interested in. One of the bedside lamps did not work and was not repaired while we were there. The bathroom door was warped or ? it would not close and the very old shower had mold in the corners. The outside was in nice shape and I think they are updating their rooms, but this one was still in need of attention. Overall if I wanted to be in downtown Modesto again, I would stay here. OK value and looks like they are trying to keep it up. Lots of homeless in area, but that seems to be true of every downtown area. The air-conditioning was great. We ask the staff to address the broke showerhead and it was not addressed we would expect better service by the staff or we would not stay at this hotel again . The room was otherwise ok .We should be accommodated for this issue. The staff was very friendly. The room was clean and very comfortable. The area was quiet which made it very relaxing. Close to good restaurants. Overall a very nice place to stay. I will be going back to stay there. We expected better. Hard to find and in a questionable area. Old rooms. We were assigned a room directly in front of the ice machine, which ran all night and was visited many times by homeless people. Other rooms were under renovation. Breakfast was very simple and basic. Not the best experience. The location was perfect. The location was under construction so it made for a bit of noise in the morning. Also, it was over 100 degrees so we had to share the ice with the homeless in the area (they drained the machine) but I guess everyone was thirsty. "Zombies walk the streets of Modesto." We had never been to Modesto before and we booked a room through Best Western corporate headquarters. The Town House Lodge is downtown and driving in Mom and I looked at each other with concern. It struck me instantly. Meth has come to Modesto in a big way and brought a massive homeless problem with it. Meth-Zombies walk the streets here! As we got to the hotel we felt a little better, the check in staff was very nice. and we saw the workers working on the renovations. And figured we were alright. Also the library next door is very nice and we felt, briefly we were in a nicer area. And started to unpack the car,. Then we heard the siren and the fire truck rolled in to attempt unsuccessfully to collect the hammered drunk woman making a scene. To the delight of the homeless nearby. Very large homeless issue here! CLEARLY the homeless problem is drug related. Only a few places we have stayed made us feel unsafe. We felt unsafe here. Nothing happened. But we got EVERYTHING out of the car! The room was newly remodeled and seemed to be still in the process of being remolded. We had no mirror above the sink. Also no hairdryer. Mom called and asked for a hairdryer only after showering and finding there wasn't one,. we were told they would bring one right up, but we never received one. As a man, neither was a big deal to me....but Mom was MAD! I went to the ice machine and found it was broken or out of ice and noticed the snack machine next to it had been crowbared open and emptied. The breakfast was VERY good! Our room was very clean, the bed sheets and towels were clean and the beds VERY comfortable. This Hotel IS NOT a bad Hotel. But Modesto made an impression. We wont be back. Overall good experience even when it was well over 100º degrees outside. The Internet was intermittent at times but we could blame the intense heat outside for that. The air conditioning worked superb and to me that matters the most. 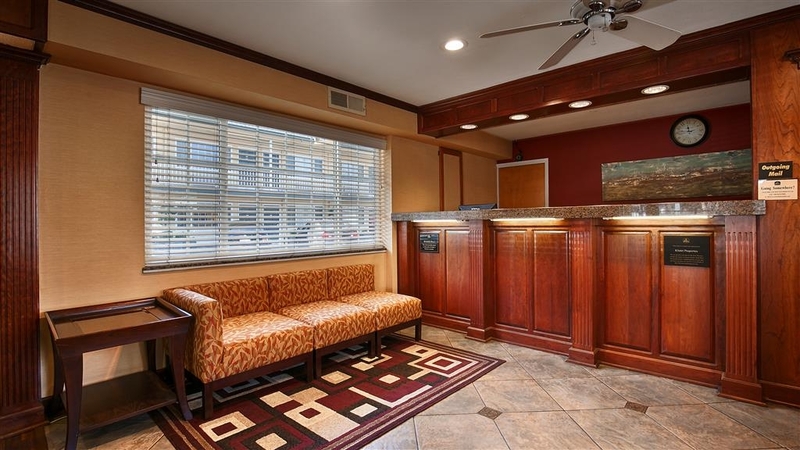 "Best Western Town House, Modesto, CA"
Very nice and convenient to downtown restaurants and lounges. The rooms are small but decorated nicely with all the conveniences. The breakfast "room" needs to be larger, however, understandable because of the renovation and construction going on. 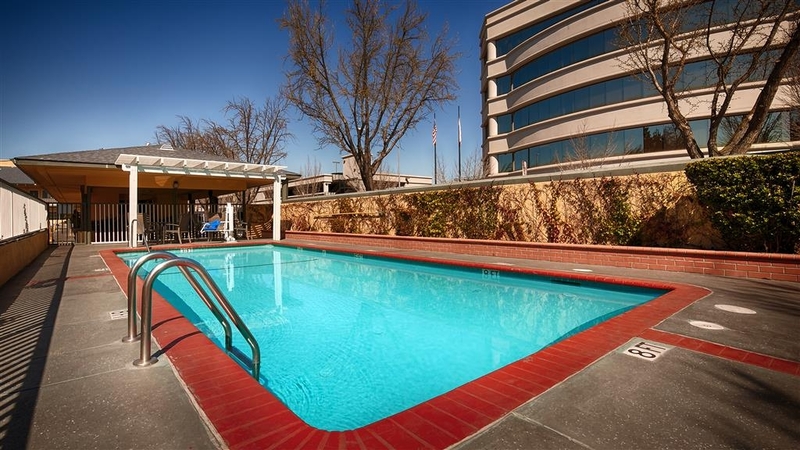 Located in downtown Modesto, City Library, Bank of America, & McHenry Mansion are nearby. Farmers' Market in the streets on Saturday. Renovated rooms have BW decor, comfortable bed, clean room, wifi was great, staff was friendly & helpful. Breakfast was good, varied selection, well prepared but breakfast room was small cramped space. The reason for the average rating is the poor sound insulation as expected in an aging building. Also, the room is small; if more than one in the room, may be a problem getting showered & dressed. Compared to other BW hotels on this trip, the price seemed $10-15 high for the value. If your priority is being in downtown Modesto, this is a good hotel. Nice place, nice staff, and quick check in and check out. I really liked the room and bathroom both were very clean and decorated nicely. I would recommend this best western to anyone. My stay was above satisfactory. 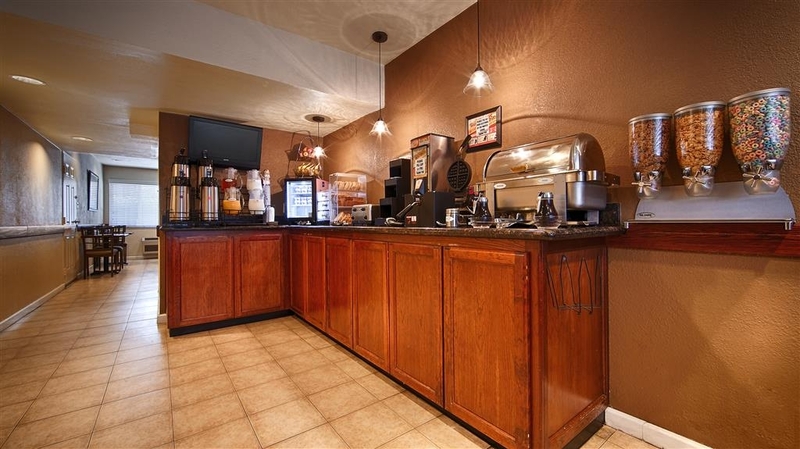 I chose this property (online) strictly because of its proximity to the Gallo Center. I wanted a place where we could stay and walk to dinner and a show at the Gallo. We were coming from Sacramento and simply didn't want the late night drive. 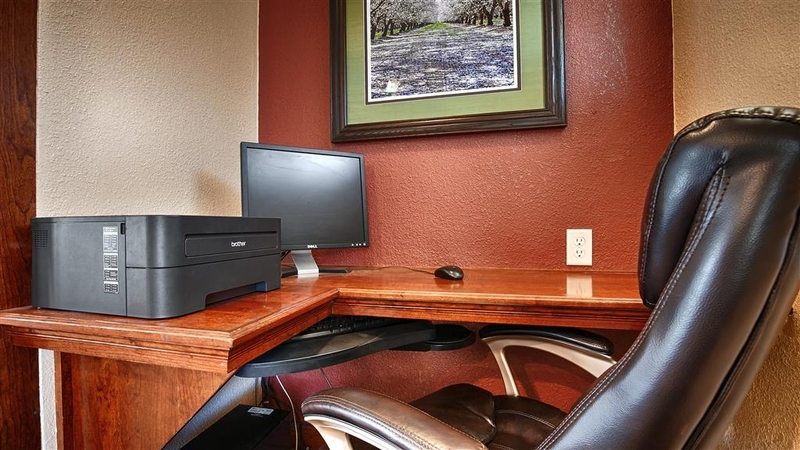 This provided the perfect location and a surprising amount of amenities. The hotel and room were clean and the staff friendly. The surprise came at breakfast. Eggs, sausage, bacon, the works!. We had expected a pastry and juice like most properties these days. A great start to our trip home. "much better than the Clarion Hotel...."
stayed in room 205 for one night; room was clean and satisfactory with king sized bed. Room location is in the middle of the building between 2 sets of stairways, rather far away so a person with walking issues would have better luck on the ground floor. Free breakfast was satisfactory with a good choice selection for a non-formal breakfast. "good thing it was cheap"
My room, 126, was nasty. Blood on the wall in the bathroom, smudged hand prints on the doors, peeling wall paper, the bathroom was laid out poorly, just enough room to fit a toilet between the wall and the shower. If ever I stay here again, I will inspect my room carefully before staying here. I like BW, this place was not up to the BW name. Have fridge and microwave in room, shower is decent size. Neighbor not the best but ok. Room a lot outdated. Walls are extremely thin. Breakfast was ok, did not have a a lot left and it was only 7am. Toaster didn't work. "Room needed some attention from maintenance staff"
I have been staying at this hotel for nearly 20 years on frequent trips to Modesto. Perhaps it is under new management because I have noticed that the room needed repairs and attention -- leaky faucet, three missing light bulbs, loose switchplate and the breakfast had fewer items than I recall. Price was the highest I had ever paid at this location. Maybe someone was cutting some corners. It's a pity --location is the best in downtown Modesto. Was working in downtown Modesto and this was the perfect location to spend a couple of nights. The hotel was clean and safe, the staff were friendly and professional. I will be staying here again in the near future. "Best Western Townhouse in Modesto, CA"
This is on OK place to stay, but not in the best location. I booked it partly because of the in-room refrigerator & microwave and the hot breakfast. The breakfast was good. They had lots of selection. 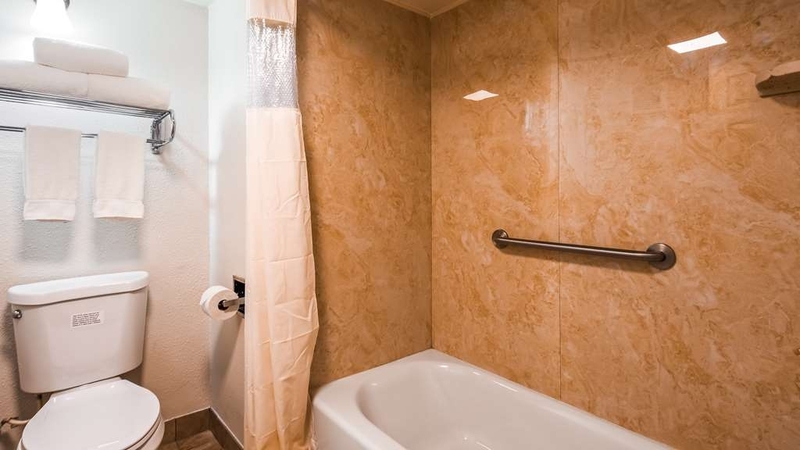 We must have been in a handicapped-accessible room, b/c we had a shower, but no tub. The bathroom was nice, but had an odd layout. It was a bit noisy also. The pool is nice, but hot tub was not hot & was a bit green, so I did not get in. I stayed here for two nights with family. The first room they gave us was room 108 it looked nice and clean and I liked the carpet but it smelled like oil so we asked for a different room and they gave us room 129. The room was also nice but the carpet wasn't upgraded like the other room and it smelled like urine really badly but we decided to take it because my mom liked the room more. The room was clean for the most part but the bathroom didn't seem as clean as it could have been and I noticed there's was some cracking through the wall above the refrigerator. There is a bar right behind this room and it gets noisy in the middle of the night you can hear drunk people hollering and around 5am I got scared out of my sleep fr what sounded like really loud gunshots but I'm not for sure that that's what it was and the second night, our next door neighbor was up all night keeping me up going in and out of their room turning their car alarm off and on more than a couple times, don't know what that was about but if there were no bar or loud noises nearby I'd say it's a good hotel to stay at. Got our reservation off booking.com as we drove up hwy 99 and really didn't what to expect. Our surprise! Beautiful old style hotel in immaculate condition. The room are all updated complete with wonderful walk in showers....although rooms are smallish, every amendity has been thought of in great detail. And the bed was Devine after a long day of traveling. The room appeared to be in need of updated electrical. Some of the wall sockets were loose. There was an electrical cord plugged in and going across the room for the lamp to be lit. The bathroom door would get stuck so we choose to not close it all the way. The bathroom floor was sticky- shoes would stick and leave footprints- sure did not want to walk barefoot on it. I am only making comment on the room we stayed in. As far as I know and hope these issues were only related to my room. We stopped here as part of our wedding anniversary roadtrip. We were treated with a friendly smile, room was extremely clean, good breakfast, and good restaurants around you could walk to. McHenry mansion is just around the corner. Thank you for your kind words about our hotel. We appreciate your patronage and hope you will stay with us at the Best Western Townhouse Lodge the next time you are in Modesto. We look forward to your return. The temperature hit 108 degrees Fahrenheit on the highway between San Francisco and Modesto. The room was a comfortable 73 degrees as soon as I checked in and remained that way throughout the night. The breakfast lady is a character, like the no-nonsense waiters in Chinatown restaurants. I love Modesto with its vaqueros, campesinos and admirantes. Long live the Central and San Joaquin Valleys. Long live earthly desires! Thank you for your review. It is always gratifying to know that our guests had such a nice and memorable stay with us. We look forward to seeing you the next time you are in the Modesto area! "Treated like family; great place to stay"
After a stressful day taking care of my Dad who was in the hospital, our Best Western check-in clerk was a pleasure to work with. We were tired and stressed out and he did everything possible to help us with our late check-in. The hotel was so comfortable, the staff was friendly and the pool was great! The breakfast has so many options to choose from. As usual, the staff was friendly and accommodating. We would visit again! Thank you for taking the time to write such a complimentary review. I have passed on your comments to my staff. It will serve as an inspiration to them and their continuing efforts. "By far our worst best western experience"
This was by far the weird experience ever in a best western hotel, the room on checkin smelled like it had a kitty litter box hidden somewhere within the room. We stayed here on our way to sequoia from SFO. There was just one soap in the bathroom( small things like these eventually add up to your frustration) plus when we went for breakfast in the morning around 8:45, the sausage and egg trays were almost empty, 2 other families came after us so they refilled it with bacon. All in all was a waste of money. There are plenty of other options in Modesto, stay away from this one. I was disappointed with this hotel and will not be staying here again. Although the room looked nice enough and generally clean, there were a few things that were less than expected. The first thing we noticed was that the area surrounding the hotel was somewhat undesirable. Next, after checking in, we found that when we went to call the front desk to ask for extra pillows, there was no phone!!!! Not only was the phone missing, but the entire phone socket had been pulled out of the wall! As a result, when we went to check out in the morning, we were unable to check out over the phone, obviously, and we had to go into the office to complete check out. The final thing that clinched my dissatisfaction with this location was the breakfast. Although there were a lot of offerings -- from scrambled eggs to sausage to bacon and waffles -- the quality of the food was quite poor. I found the eggs and sausage to be inedible. I am not overly picky, but, really everything tasted pretty artificial and I could not finish the food I had taken. Sadly, I would not recommend this place. Though it was not a complete disaster, we will be avoiding this place the next time we pass through Modesto. "I went for travelling and will choose a safe, comfortable quiet hotel. best western hotel is my favor hotel I would like"
I like the beat western hotel and perhaps we will choose it for next travel if the price is fare for us . compare with other travel lodges best western of this one has good quality furnatures and comfortable beds. it is worth to live in. Located in downtown Modesto, therefore lots of unsavory people nearby. A homeless man came into the breakfast room one morning, although it is keycard access only - he must have followed someone in. In any case, he was shooed off fairly quickly by staff, but not before screaming obscenities at everyone. I'm a traveling nurse and have stayed at three Best Westerns in the area, and this was the worst of them, mostly due to the sketchy people staying there. People were slamming doors, hanging out in the parking lot and talking very loudly. Beware of first floor rooms, as you can hear people in the room above. I understand that's out of the hotel's control, but I thought it worth mentioning. I also found food in the refrigerator left from the previous guest. If there's one thing I can say, the staff is nice. "Saturday morning noise, impotent staff." It's loud and the staff is wantonly heedless. It was Saturday morning at 7 AM and there was a large, diesel party truck with a full crew loudly unloading tables, chairs, and other items via a lift gate, slamming them on the ground...all in the Best Western parking lot right outside our room! I called the front desk to complain and ask why this was allowed to go on and spoke to a person named Tessa who said "yeah there is a mansion next door that has parties every Saturday and the law is they can do it after 7". I was pretty sure that wasn't true so I looked up the Modesto noise statutes and it was very clear: "no noise of loud, raucous nature is allowed before 9 on weekends and holidays" so I called the police. They came out and told the crew to stop. What should have been a pleasant Saturday morning of sleeping in was ruined. I got the impression that, since this all commenced in the Best Western parking lot and the front desk person was quite aware of it, this is a routine thing. Keep in mind this is supposed to be a hotel for cryin' out loud! Thumbs down. Caveat emptor. "Okey for price and location"
Rooms were clean (except for a screw left on the floor that I stepped on, and sticky bathroom floor). Walls were thin as paper (not unusual in these hotels) but thankfully we had quiet neighbors. Hotel was well located in downtown Modesto but the premises were not very appealing. Nothing spectacular but okey for a quick stop. Stayed here because of a concert we attended at the Gallo Center. It was the perfect location. The person who checked us in was very helpful. The room was clean but nothing special. The bed was not very comfortable. The breakfast was great with eggs and sausages, waffles, fruit, etc. Would stay here again. "Homeless knocking on room doors"
This older motel in the Best Western chain is in downtown Modesto, on a street corner, with one way parking lot traffic flow. The front desk is separate from the rooms, has a computer and printer for guests(couldn't get on nor could the employee), minimal décor in the area. The room needed work, was musty with dirt in the corner, some paint on the carpet near the bed, worn desk edges, and a door that needed cleaning. There was a refrigerator(not on) and a microwave. 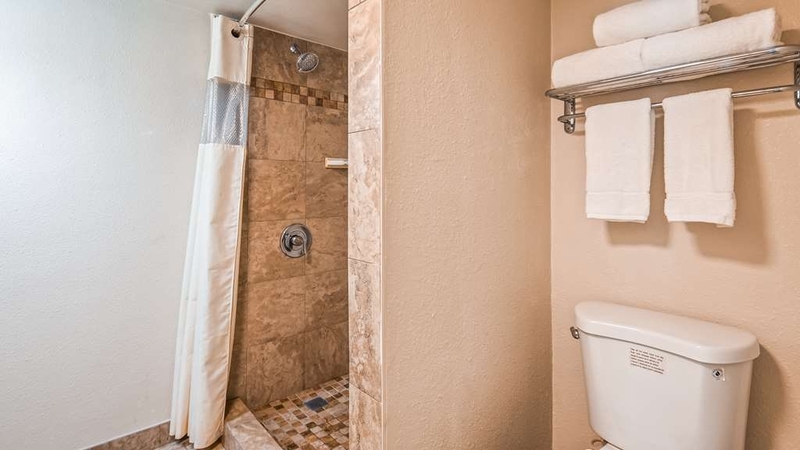 The toilet in the bathroom was tucked into a corner, facing the side of the shower. I took pictures but can't get them onto this site. L probably wouldn't stay here again. 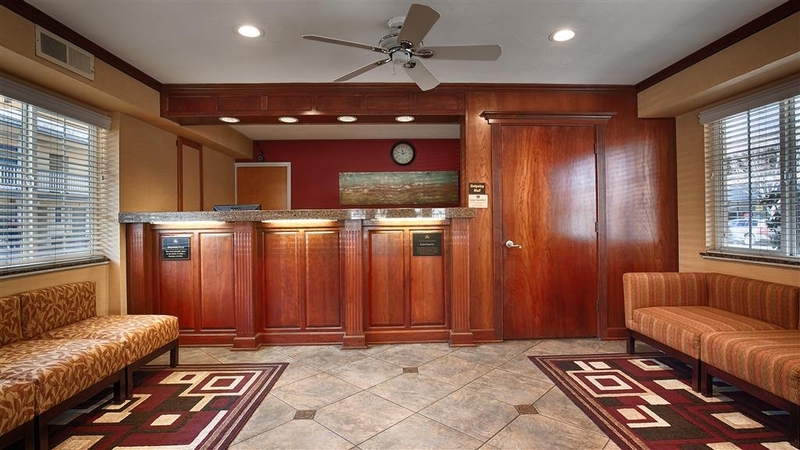 "A Clean, Comfortable & Centrally Located Hotel"
We were in Modesto for the Surgical Artistry Marathon on 20-March-2016 and stayed at the Best Western Town House Lodge for the night of 19-March. The layout of the hotel is like a Motel - 2-floors with rooms along open verandah and parking in front. We stayed in a 2nd floor room. The room was fair-sized, well appointed with TV, a single-sofa plus footrest and a stand-alone air conditioner. There was a microwave, a refrigerator and coffee-maker and coffee etc. in the room. Wi-fi internet connection was Free and available in the room. The bathroom with toilet was clean and had a shower enclosure (a bit small !). The complimentary breakfast was adequate and had cornflakes, scrambled eggs, sausages, waffles, breads, cup-cakes, apples/bananas, milk, hot chocolate and coffee. The reception and other staff were friendly and helpful. There is a pool opposite the reception. Adjacent to the hotel is located Modesto's historical McHenry Mansion and nearby is the McHenry Museum and County Library. Restaurants are within walking distance from the hotel. Many reviewers have mentioned about noise such as of traffic & trains - we did Not feel any disturbance and our room was quite. A basic hotel which is clean, comfortable and centrally located. 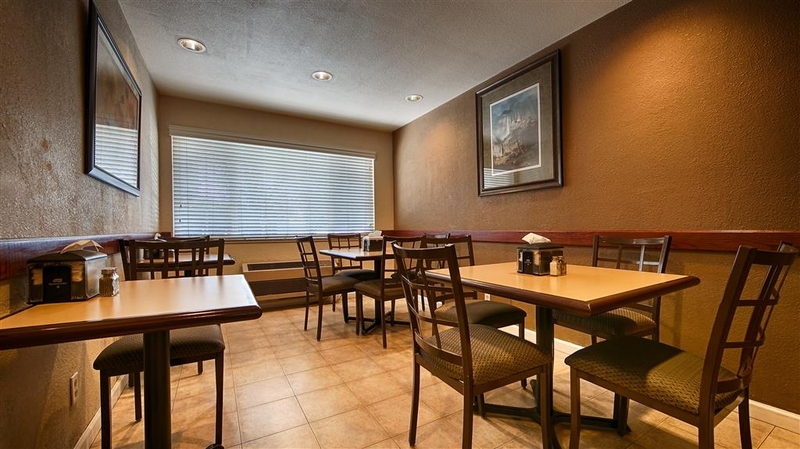 "Smaller, older Best Western, great breakfast"
The room was smallish, and clean. The hot breakfast buffet was delicious. The Spa was closed (beginning of February, but I sure would have loved a hot soak.) There was a check-in host, even though we arrived late. "Better this the Double Tree"
If you like an old hotel and the sounds of trains, then stay at Double Tree. 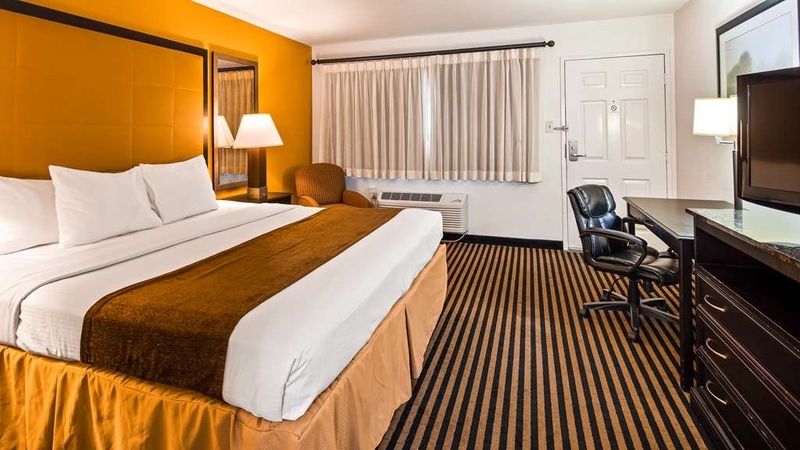 If you like a nice quite room that won't brake the bank then Best Western is for you. You can walk to Denny's, Jack in the Box and the Double Tree. Free parking. Double Tree charges for parking..
We only stayed here the one night and the room and service was great, only downside is it's a little noisy from traffic. trains nearby were fairly noisy most of the night. Maybe try to get a room out the back facing the mansion. On the upside the breakfast was awesome, one of the best we've had on our trip. Hats off to the Best Western staff in Modesto, California, they are very professional and friendly. They all went out of they're way to accommodate me while I stayed at the motel. This place was very clean and located close to the downtown area. I will recommend it to all of my friends and family. downtown modest, nice quiet place, enjoyed it, staff were friendly and price was decent. rooms look nicely remodeled. the breakfast room was small but that didn't matter too much. we came here with our family and loved it. "Waiting for the Turlock Swap Meet"
Overall we found this hotel to meet our needs, but being tall there's a couple of issues we had with our room: The toilet has a shower stall directly in front of it and we had difficulty using it (I'm over 6'). Also the shower is not meant for someone over 6 feet, had to really crouch down to wet my hair. Breakfast was okay and the bed was really FIRM, but there was plenty of pillows and they were great. We'll most likely stay here again when we're down this way. Decent room on a well maintained, slightly older property. Staff were excellent. Breakfast was a nice plus. Not sure if the location was a plus, since I wasn't there to see the town. I did notice an apparent lack of nearby eateries. All in all, definitely a super positive experience. "Train noise & Bad Breakfast"
The room was on the first floor (of a two floor motel), and the person walking on the second floor caused their floor (our ceiling) to squeak and crack with each step. We could hear a train whistle every ten minutes from midnight to six am. The breakfast area was small (about 7 tables), there was a good selection of items for breakfast (however the eggs were cold and not good, and the sausage was uneatable). The check-in / out process was quick and efficient. We spent 1 night her.e for a wedding. Property is old but well maintained. Only staff we interacted with was front desk, but she was very helpful, friendly, and efficient. Room was a king with a fridge. No tub, but room was very clean. No restaurant, but a bar and a Starbucks is nearby. Breakfast at the property was very good, included waffles, eggs, sausage, etc. Mattress was very firm, great for me but not so much for my wife. I would recommend this hotel for anyone and everyone! Overall great experience! The street was very busy when we got there, but once the pm traffic made it's way home, it was nice and quiet. The Boardroom around the corner was convenient for an adult beverage as well. All i can say is this would be okay for a short term / overnight stay. Itis located in the business section of the area which shuts down at the end of the day. Makes walking around at night a little uncomfortable due to the homelessness walking / biking around at night. However there is a library directly across the street. no outlets in the room next to the bed. Had to unplug my clock to charge my phone. Limited restaurants / bars within walking distance. You will have to drive to see a wider selection. "Good but could be a little better"
We stay here occasionally when we come to California to visit relatives. This time was okay but they could pay a little more attention to details. No wash cloths were in the bathroom. Regarding the laptop there was no convenient plug to use. It is well lit on the lobby side. For those not familiar with Modesto it is right across from the Library and next to the McHenry Mansion so in that aspect it is fairly quiet at night but sometimes people create noise that are staying in the hotel. It is fairly safe right there at the hotel but I would not wander around at night as Modesto has changed a lot over the years. The staff has always been friendly. Still the typical breakfast - scrambled eggs, bacon, sausage, waffles, breads, cereal, yogurt, etc. The breakfast room seems kept up. I stay in hotels over 150 Days a year. This was by far the worst hotel I have ever stayed in. I was in the room for about 20min. And left. It needs a overhaul and huge remodel. Bed is horrible, and just dirty. Please don't stay here. You will regret it. Good service at the font desk though. I would not stay here again. There is no noise insulation and you can hear EVERYTHING above you. I moved up stairs but knew that the people below could hear every barefoot footfall I made. If you have long legs you have to sit on the toilet at an angle because the wall is so close. People smoke in the parking lot and the smoke comes in the heater ventilator. There is only one thin blanket on the bed and that is why the heater was on. Several guests there exhibited obnoxious behavior, including one talking very loud on speaker phone on the balcony for several hours. The motel actually provided an ash tray on the wall in the parking lot, so people hang out there and smoke. Probably not the best price in town but a very good quick check in, clean, and ready for a good sleep. The internet was fast, bed comfortable and not far from Hwy 99. The pool and hot top looked clean and inviting. We will try it out tomorrow. It is next door to the old McHenry Mansion and close to the library. I liked to stay in this particular downtown area because of its location to businesses and Hwy 99. Lately the homeless people hang out behind this location and on the side where the bus stop bench is located. I feel its unsafe for my wife returning from the downtown businesses four blocks away in the evening. I have had two or more bad experiences of housekeeping not taking care of my room and I reported it with no feedback from the front desk. I usually leave $10.00 for the housekeeper each day, now that will no longer happen. Find another place to stay for you service and safety. A native of Modesto, CA. "Recently remodeled, clean, and good downtown location"
We did a 'walk-in' and were offered a good rate. The rooms are small but nicely modern with clean white bedding and decent amenities. Remnants of the old motel showed in the oddly laid out bathroom. There was only a stall shower - no tub. The biggest draw back is that there are no windows in the back of the room or bathroom, so there is virtually no airflow, and the front window looked out directly on the parking lot and sidewalk, so once you were inside, it was curtains drawn and artificial air and lighting. But if you're there for a good night's sleep in a comfy bed, this does the trick. We were there on a Sunday, and downtown was quiet - we did not experience noise issues other reviewers allude to. The "breakfast" is typical for this price point - it will fill your stomach but not nourish your body. Skip it. Reasonable rate for one (1) night stay just to sleep in. Could have slept better if the noise from the exhaust fan in the bathroom was not left on operation. Noise from Upstairs Room of Room 120 could have been avoided if we have complained but other guests' are entitled to their individual rights without realizing that they maybe making some noises unintentionally. "Nice Hotel except for the noise"
The hotel is rather nice. The rooms are cozy, beds comfy, pillows new and a clean look. Staying here was one of the noisiest nights of my life. I was awake from 1:30am until I left at 9am. Horns honking, and neighbors partying. Wasn't impressed how it was handled when checking out. I have enjoyed the Best Westerns over this past year and intend to continue staying at them. Great value for the money. "Everything you need, plus value"
I stay here several times a year when I am Modesto for work. I am practical, and whereas the company standard is any Marriott brand, I do not see the benefit of paying more. This place does the job. It is a bit old school, and the bathroom a little cramped, but I am fine with it. Cable, clean, Wi-Fi, parking close to your car, I like it well enough. Also, I like to walk around the downtown area, there is a pub, down the street, a bar on the corner, and a couple of places to eat besides the pub. Modesto, or at least this part is not bad, not great, but pretty quiet and a good place to stretch the legs. The pool at this BW is very clean, and I rarely see anyone in it. I also like that there is no freeway noise. Ideal central Modesto location, close to theatre etc. Be carefull when reading the directions as they are turned around!! Older hotel but well renovated, clean and comfortable although the shower in our room was a little ancient. Staff helpful and gave us a local pub for dinner within walking distance. "Nice onroute to Yosemite. " I stopped off at this hotel on my journey from San Francisco to Yosemite and was the best place to stay for one night on route in Modesto. The rooms were clean and spacious. There was breakfast available but I didn't go. However I would say that the room walls were incredibly thin so could hear neighbours.